The Jameson Bartenders Ball was on Monday 27th February 2012 in Los Angeles and turned out to be an extremely fun night for all who ventured out to Hollywood. Held at the Nightclub Vanguard, this was my third year at the Bartenders Ball, but I do believe it may have been the best so far! Unlike the usual places I talk about, Vanguard is a night club as apposed to a bar and has the feel of one large warehouse with a stage, bars and tables surrounding a dance floor. The place itself is huge with a variety of side rooms and an outdoor patio/garden for smokers. Their website describes the venue as; ‘Huge. 17-foot side walls and a 25-foot apex..The stage, flanked by a semi-circle of large video screens, hosts live acts. Gyrating bodies on the spacious cherry wood dance floor invites onlookers from the VIP balcony above.” I couldn’t put it better than that, it was exactly as described. I am not really in to nightclubs anymore, and feel really old saying “the music was a little loud for my liking” but truth be told I am done with my Hollywood clubbing days, i’d much rather be sipping on a clover club at a quiet bar. The music was ridiculously loud to the point where I could feel my body shake from the base out the speakers! 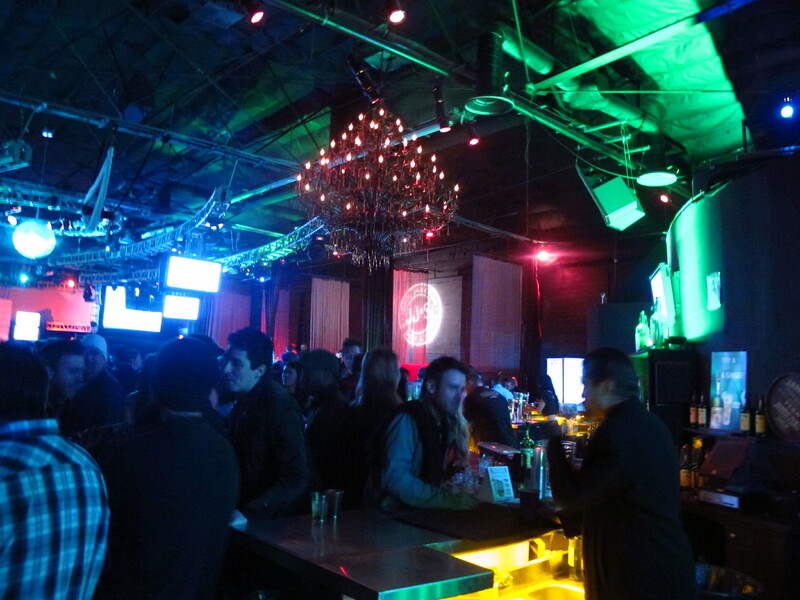 Having said that, if i’m going to venture out in to club land…this was a pretty cool venue to attend. The music line up was much better than previous years, after a good DJ there was a performance by ‘Young Dubliners’ which changed the tone to more Irish Rock, but was fun and certainly fit the Irish ambience. The band ’51/50′ were fantastic. They consisted of a DJ mixing the latest dance tracks whilst a drummer beat in time to them. It was an excellent show and got the whole crowd jumping. The Bartenders Ball is a night out for bartenders only (and there are plenty of them in this city). It is an event sponsored solely by Jameson Irish Whiskey. Every year it is held at a different location with lots of fun freebies and goodies on offer. There were t-shirts being pressed with Jameson themes; A lady was airbrushing Jameson logos on to various body parts, there was a photo area for professional pics and cocktail servers bringing little hor d’oeuvres around including delicious mini burgers and my favorite, coconut shrimp on a stick. Being a Jameson fan, it’s a night I never like to shy away from. 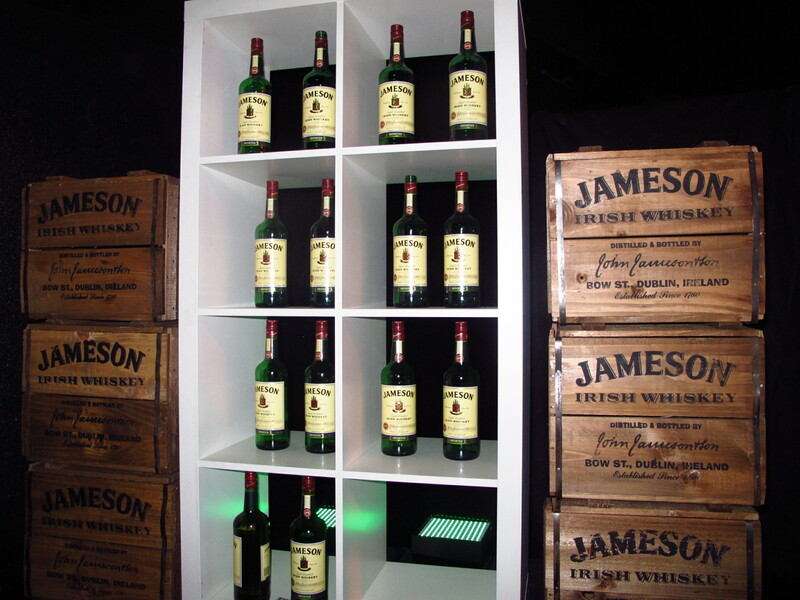 Jameson sells 30 million bottles a year making it the best selling Irish whiskey in the World and it’s easy to taste why. It is smooth with no nasty burning after taste, there are strong nutty and vanilla notes and I find it to be sweeter than most Whiskies. It is the best in its price point in my opinion and unlike American whiskies, which are usually distilled once, and Scotch whiskies which require two distillations, Jameson is triple distilled in copper pot stills. The product is made following the original 1780 recipe that uses malted barley combined with un malted barley and other grains. I actually went to the original Jameson distillery in Dublin, Ireland with my boyfriend in 2009 and found it to be an extremely interesting experience. I strongly urge anyone who goes to Ireland to head over to the distillery. They are no longer in production at the Dublin location, it has since moved to Cork, but either way the tour and museum were well worth the visit. Ever since that trip to Ireland I have enjoyed Jameson more and more, on the rocks or with ginger (real ginger that is). Vanguard looked great with the ‘Jameson Green’ lights and decorations that adorned the room and the Jameson Irish Whiskey drinks were in full supply at the 3 open bars. This years theme was strongly influenced by the ‘Barrel Men’. There was a little info on a side plaque that read ‘THE STORY OF THE BARREL MEN ICON: Working at the Old Jameson Distillery in 1780 had the best wages and maintained the best working conditions of all distilleries in Dublin at the time. To this day you see two barrel men either side of the Jameson label. These two men symbolize the generations of loyal men and women who have distinguished themselves by their hard work and passion for the Jameson brand.” I love an event with a little history behind it, but I love one even more that has such a great product for free…and in copious amounts! Dancing and drinking ensued in to the early hours and I had quite the hangover the next morning. I have been a whiskey drinker all my life and converted from scotch to irish a long time ago. While I can still really enjoy a good single malt scotch, my preference is the smooth, with just a hint of sweetness irish – it makes a great sour. I think I would have headed straight to the 18 year room!